Part of me is unsure if The African Queen actually needs to be reviewed. Everyone knows it’s a classic right? It regularly appears on ‘Greatest Films’ and ‘Classics of the…’,‘1001 Films to See Before You Die’ kind of lists and it’ll be near the top end of those lists as well most of the time. The names that flit across the screen at the start make you sit upright and steady yourself for the ride. Katherine Hepburn and Humphrey Bogart star, John Huston and Sam Spiegel (Producer of TWO great Great War Films, Lawrence of Arabia being the other one) do the Directing and Producing and the legendary Jack Cardiff does the cinematography with an artists’ eye whilst struggling with the cumbersome bus sized Technicolor cameras. The first thing of note is the Glorious Technicolor. It’s always obvious straight from the get go when I fire one up that it is indeed a Technicolor film. The colours have a slighty washed up, pastel-ness to them. I’m immediately reminded of Powell and Pressburger’s ‘The Red Shoes’ or from a Great War Films perspective ‘The Life and Death of Colonel Blimp’. The quality of the camerawork on this film is obviously of the highest quality without appearing gimmicky or strained. Bogart is shown warts and all, his face striated with age and full of character. Nothing is softened or overly lit. The jungle is shown in all its’ glory. For some, sitting in musty, damp, Odeon’s back in Blighty it would’ve been the first time they’d seen the full colour glory of the African flora and fauna. For those what don’t knows, ‘The African Queen’ is based on a book of the same name by CS Forester. The screenplay has been transferred pretty rigidly from the book by all accounts (I’ve not read it). The result is a film that has a simple enough set up, follows a straight forward linear path and ends in a way you’d expect. But there’s something a bit special about how it’s all pulled together. 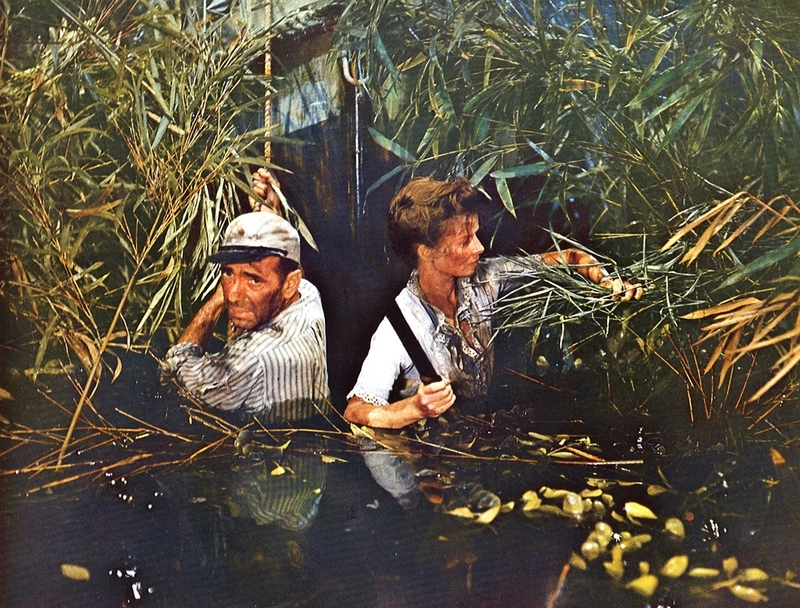 The performances of Hepburn and Bogart are great, but especially Bogarts’. She plays a stiff, aging missionary who softens and becomes more human. He, a drunken, uncouth, cowardly mongrel who sobers up and becomes a bit of a hero. He won the Best Lead Oscar for this up against Marlon Brando in ‘A Streetcar Named Desire’ which shows how well it was considered at the time. Bogarts’ character is a delivery man of sorts. His vehicle is a junk steamer called ‘The African Queen’. He turns up with a delivery at a village where Hepburn and her characters brother are missionaries. Bogart also brings the ominous news that war has been declared in Europe. The Germans arrive, the brother dies and hey presto Hepburn and Bogart set off on their adventure. Katherine Hepburn was a staunch woman by all accounts and she plays a role that must’ve been quite close to the real her. She goads Bogart, through a mixture of silent treatment, calling him a coward and mostly importantly chucking all his gin over the side, into taking an attacking role rather than trying to ride out the war by hiding up and down the river. Her plan is to use The African Queen as a torpedo, loaded up with explosives and pointed at ramming speed straight at a German owned Cruiser patrolling the lake downstream. There are problems along the way and here comes my only grumble about the film. I know it’s 1950 odd but there are several close up shots of the boat and the two leads as they go over a series of rapids. Once, twice, thrice we get close ups of them on a mock up of the boat in front of dodgy bluescreen footage. The boat bucks and rolls obviously being dragged about by stagehands as some of their mates chuck buckets of water as hard as they can straight into the faces of the stars. We then cut to a wide shot of a quarter sized model boat with two mannequins sat bolt upright with a rod up their backs. I don’t know what they could’ve done differently but it all looks a bit cheap after all the other good work going on around the place. Having said all that it really doesn’t detract to any great degree from the film. This is a love story, an adventure, a war story, a travelogue (a bit), it’s a comedy, a drama and maybe a little bit of a thriller (that might be pushing it). It rightly deserves its spot on the superlatives lists. 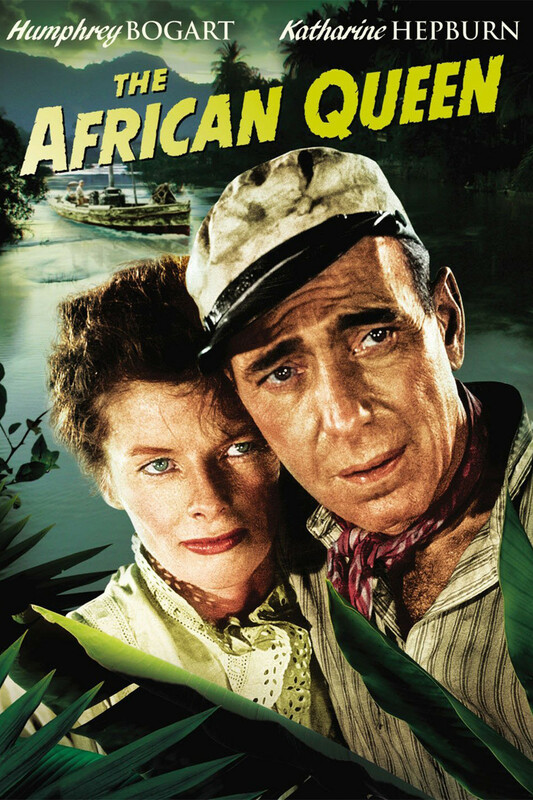 I don’t think I need to bang on too much about how great The African Queen is. It’s simple, well put together and charming. Both Hepburn and Bogart put in fine performances and their on screen chemistry is clear even though for the first half of the film they need to stifle it as much as possible. The scene early on with Bogart’s stomach making noises as he sits at the table with the stiffly prim Hepburn and her missionary brother made me LOL and that is always a plus for me. Laughing is probably my favourite thing. The time flies by and before you know it they’ve blown up the German Cruiser and are backstroking towards Kenya. As ever, if you haven’t seen it…..what the flying huck have you been doing with your life? Quick Clicky Clicky and get yourself this piece of cinematic royalty. After allowing myself the pleasure of such a great film I feel I need to self-flagellate. So what’ll it be next? I don’t know. I probably deserve a bit of a lemon. We’ll see, I might just chuck on another classic.